"During those days, pencils were easy to do but now I don't think I could be able to ink 3 to 4 pages a day because the pencils are crazy, so much detail." Romeo, thank you for agreeing to answer some questions about your time as inker on the Fantastic Four. Although you have now officially retired, you’re still working on comic projects of your own, including a graphic novel, “Maligno.” Can you tell us a little more about that? The "Maligno" is a novel about a little kid who had no one to play with and found the Maligno and befriend them and learned many things from them. But the boy has an inborn talent and was nourished, he became very powerful and in the long run he and the Malignos became enemies. Tikbalang, the Horseman was the one who introduced the boy to the Malignos, but he fell in love with the boy’s mother and want to take her but the boy w/ his power defeated the malignos and he put them in a secluded place... where nobody will see thus the myth about them stays. I have twelve issues (14 pages each) and the end of the first chapter, penciled and ready to be inked. The second chapter is still in the making… explaining where did the boy gets all that power. Your work has a lighter, more ethereal quality than many other inkers, without so many “blacks” and bold shadows. Do you think this is a unique selling point for your inking style? No, I just follow the pencils faithfully. If the penciler is good, my inking also becomes good. Also, most of the pencilers don't want their pencils altered, no problem with me. I saw many mistakes but I only corrected the worst and leave the minor as is. What they gave me to ink is what they will see. The Editors love it and I'm very fast. Sometimes I'm still doing an assignment and some Editors will call if I can help them... and I never refused. Also during those days, pencils were easy to do but now I don't think I could be able to ink 3 to 4 pages a day because the pencils are crazy, so much detail. I’ve noticed that some of your recent work appears to involve experimentation with other material for inking, such as an illustration of The Green Lantern on your blog which looks like it was crafted with other tools as well as brushes. 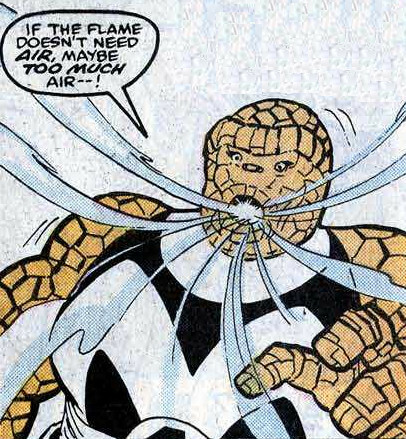 Is this something you’ve consciously worked at, and did you experiment on the Fantastic Four? No, before I used pen and brush when I was still active in comics, but when I retired, the brush I was using (Red Sable) was very expensive so I tried to use markers which is affordable and so my style changed. You mainly worked for DC, and had only been working for Marvel for just over a year before getting your first guest spot on the title; a single issue story by John Buscema, with the Thing and Thundra. What was the experience like? I don't remember it anymore, too many I’ve done. I mainly worked w/ DC because when the Teen Titans hit the ceiling in circulation, they offered me an exclusive contract and made my rate per page equal with the top artist. And not to mention the royalty. After 8 yrs or so, Teen Titans became slow and they let me work outside. That's the time I went to Marvel and they gave me work. I never thought John Buscema was a legend then. Tony DeZuniga was actually the first Filipino artist to work on Marvel and DC, and also the first to ink the Fantastic Four, with a single issue (#190) in 1978. Just how influential was Tony in the Filipino artistic community? Tony was an inspiration to all Pilipino artist, but not to copy his style. Some think they were better. But Tony got the edge because he was here, near the money. About the Fantastic Four he did, I'm sure it was good. Never saw it. Although most of your work on the Fantastic Four was inking Rich Buckler (eight issues), you also inked half a dozen Keith Pollard issues, and one by Ron Lim. Was there a great difference in the working practises between the three? Yes of course. Different artists, different style. But I'm only an inker and I follow their pencils. Keith Pollard do a breakdown and of course I have to add my share. 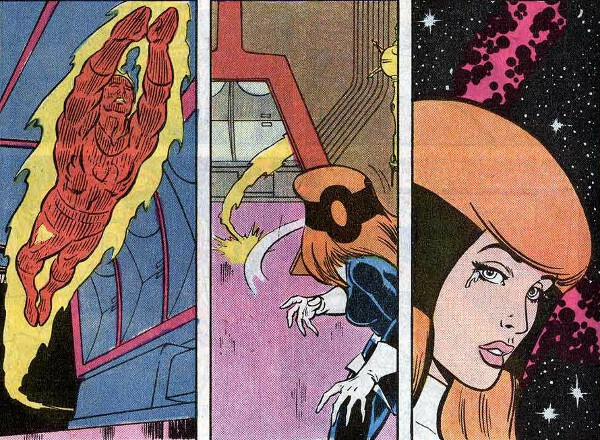 Steve Englehart spoke to the site and said that he did all of his issues using the old “Marvel style” method, with the artist working to a general plot agreed between the two of them, and then Steve adding in the dialogue later. Did you get to have any direct involvement in this process at all? No, none at all. I wouldn't agree if they asked me. I'm very busy inking DC and Marvel stuffs at the same time. Steve’s run on the title was met with creative clashes between himself and Marvel editorial. In just your fourth issue for Steve as inker, he’d changed his credit in protest to “SFX Englehart”, and two issues later he was writing the title under the pseudonym “John Harkness”, as he believed he was being creatively restrained as a writer. Were you aware of any tensions behind the scenes, and did it affect your own work? No, I'm just waiting on what & when they will send me assignment. While waiting for them, I'm busy doing some. But remember this: "I always finished my assignments on time." There's one time when when an Editor was puzzled how I did it. He tested me by calling and asked for finished pages. I said I'll give him 2 pages tomorrow, then he laughed, "Biting more than you chew, eh, Romeo." I send him two pages. Perhaps the most contentious element of the run you worked on was the introduction of the “She Thing”. In some of the issues we get the sight of a Thing with eyelashes, in others they disappear. Whose decision was it to draw her the way she appeared, and did you like the character? I like to ink, it becomes my daily routine and as if it's part of my diet. If they put eyelashes on the She Thing, I'll ink it. If not, I wouldn't even notice it. It's the penciler’s decision or negligence. Many of your early issues involve a new Fantastic Four, before the old characters, Reed and Sue, come back. Did you have any preference on the line-ups you worked on? I'm used to the New Fantastic Four. If somebody will ask me to draw a Fantastic Four, I'll be giving him/her the new one. You left the title at the same time as Rich Buckler, when Walt Simonson came on board and did his own inks. Was there an opportunity to continue had you wished it? No, Walt doesn't need an inker. One regular assignment lost, got to find a refill. During that time, there are so many titles and short stories to do... also, Animation need artists.